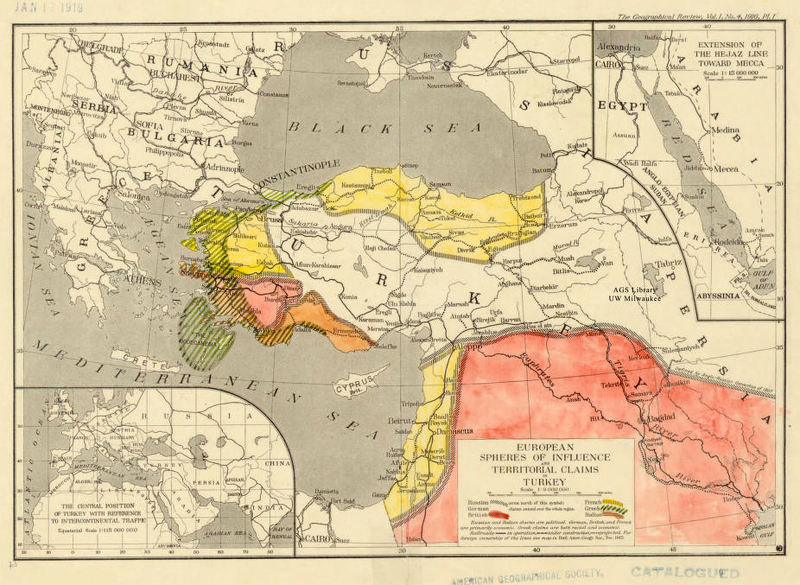 As the French and British were hammering out the Sykes Picot agreement in the spring of 1916, an American geographer named Leon Dominan prepared a map showing the possible European spheres of influence that might be carved out of the Ottoman Empire after its defeat. His accompanying article discusses the historical, economic and political background to each power's claim in the region, but does not give any specific details on how we came up with this particular division. His predictions seem to have erred rather consistently in France's favor, not only granting them Palestine but the Karadeniz too. The map also imagines Russia's sphere of influence extending from Iran into much of Eastern Anatolia and what is now Northern Iraq, which even before the revolution was more than the British and French seemed willing to offer. Anyways, for more on how this map fits into contemporary political debates, check out our other blog post on the subject!